Size: 5.9" x 3.2" x 1.5"
The navtronic 1701 is based on the earlier navtronic 16 but added a physical protection to the 14 LED-indicators on the keyboard panel. The electronics of the navtronic 16 and 1701 series is based on a National Semiconductor Chip-Set MM5782 and MM57129 surrounded by some unknown chips with ITCxxx designation. Main differences are the additional clock circuit MM5368 of the 1701t and 1701tr. If we trace back in the history of electronic flight computers we discover: The Commodore N-60, the Heathkit OCW-1401 and the navtronic 16 resp. navtronic 1701 models. All were introduced around the 1978, two years before the Jeppesen Sanderson avstar based on a Texas Instruments TI-35 appeared. 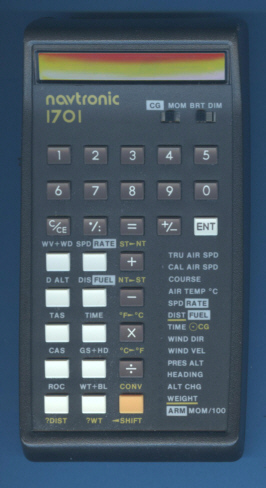 In 1983 with the Navigator and Explorer enhanced flight computers replaced the navtronic 1701 series. There are some rumors that the "1701 series" got it designations as a nod to Star Trek, the U.S.S. Enterprise is #1701. The 1701 itself comes from "FAA registry of a Waco biplane, owned by TOS chief designer Matt Jefferies". © Joerg Woerner, November 3, 2008. No reprints without written permission.